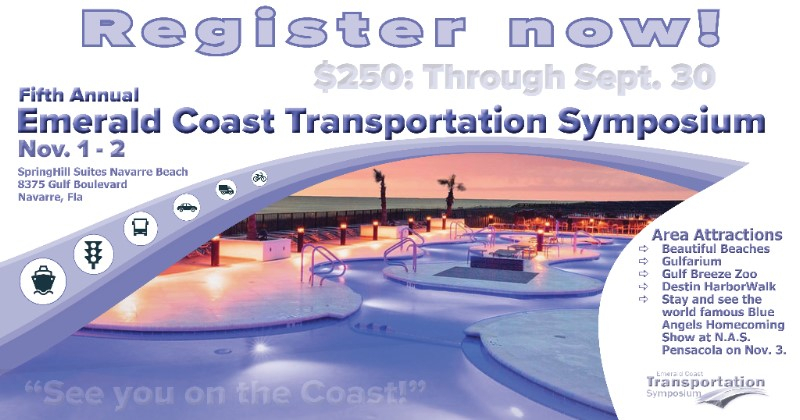 For more information, contact Jill Krug by phone: 850-332-7976, ext. 215. 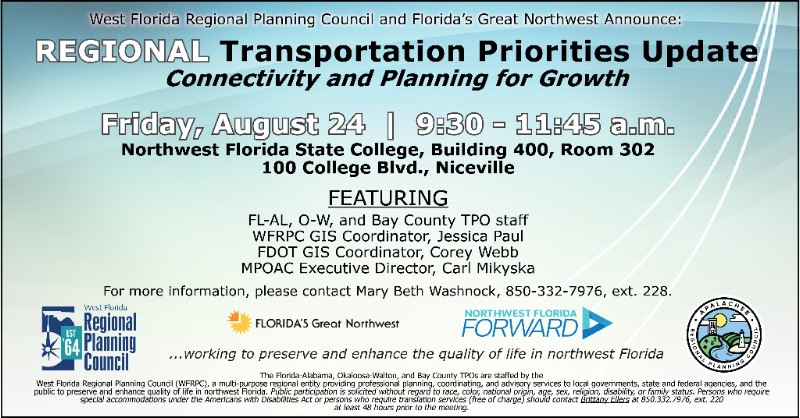 West Florida Regional Planning Council and Florida’s Great Northwest, along with partners, Apalachee Regional Planning Council and Northwest Florida Forward, will host the "Regional Transportation Priorities: Connectivity and Planning for Growth" meeting on Friday, Aug. 24 from 9:30 - 11:45 a.m. The event will be held in building 400, room 302, at Northwest Florida State College, located at 100 College Blvd., in Niceville. 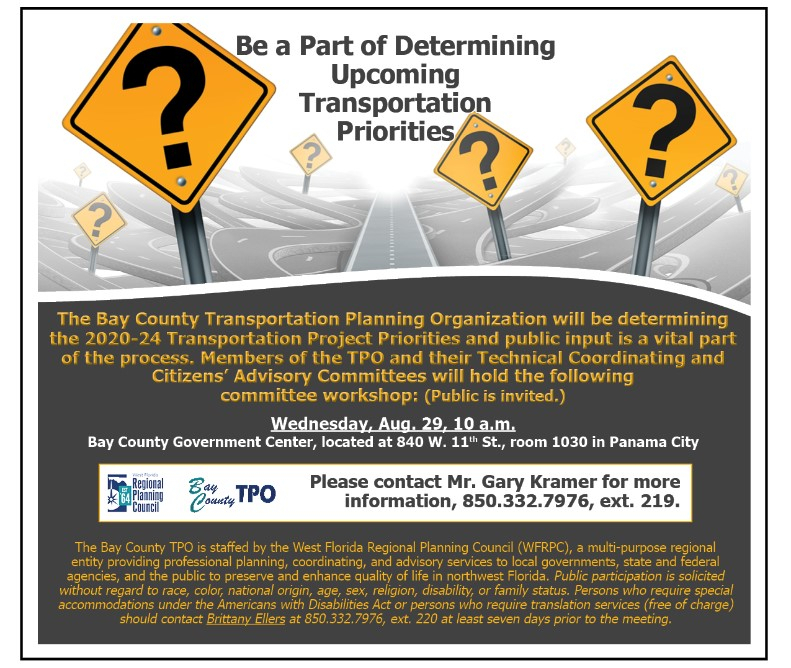 Staff from the Florida-Alabama, Okaloosa-Walton, and Bay County Transportation Planning Organizations and WFRPC will present, along with FDOT GIS Coordinator, Corey Webb and special guest speaker, Metropolitan Planning Organization Advisory Council Executive Director, Carl Mikyska. 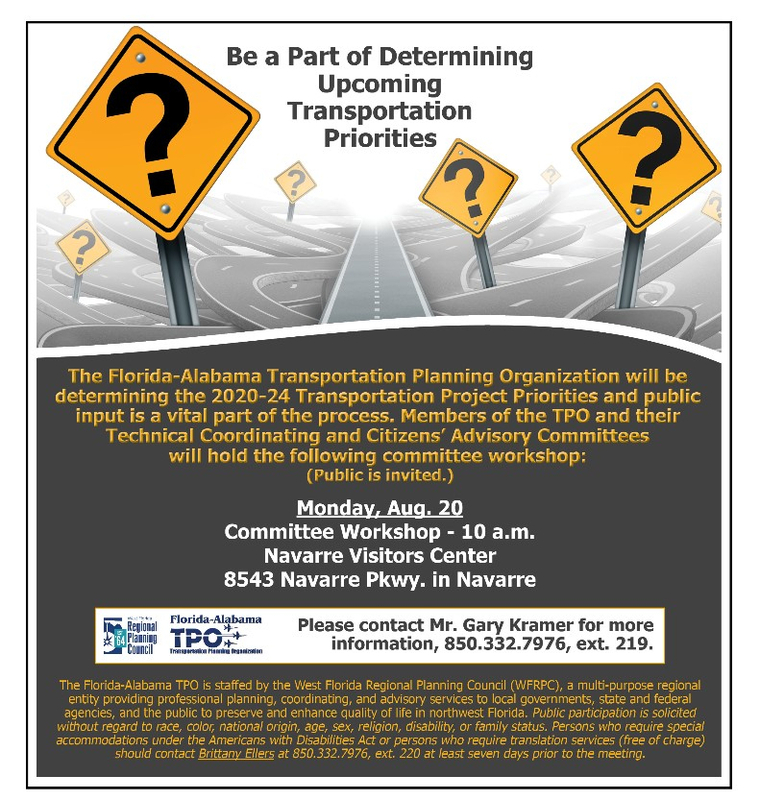 There will be an emphasis on interactive maps, transportation priorities, funded highway projects, and participant feedback and discussion. 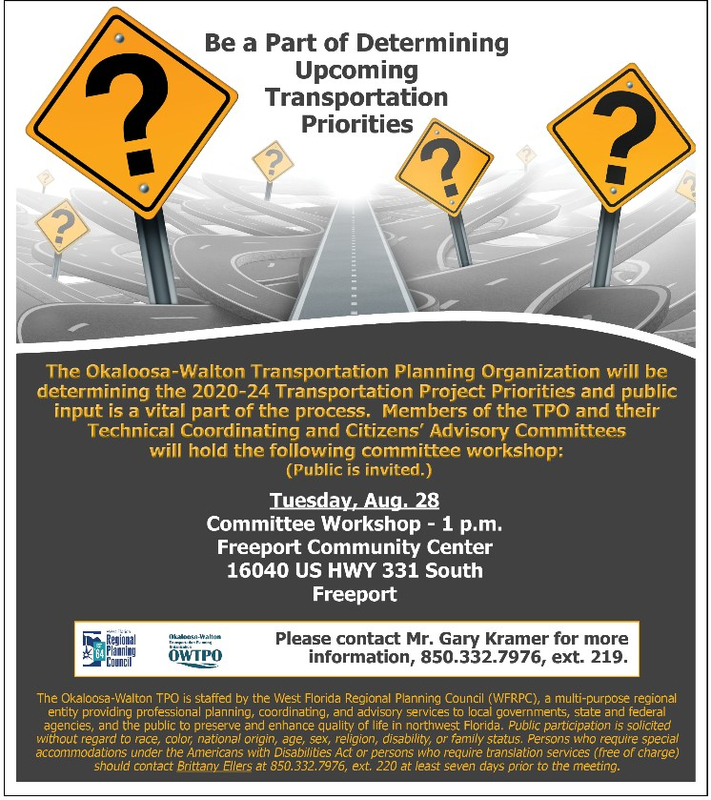 For more information, please contact WFRPC Transportation Manager, Mary Beth Washnock at 850-332-7976, ext. 228. 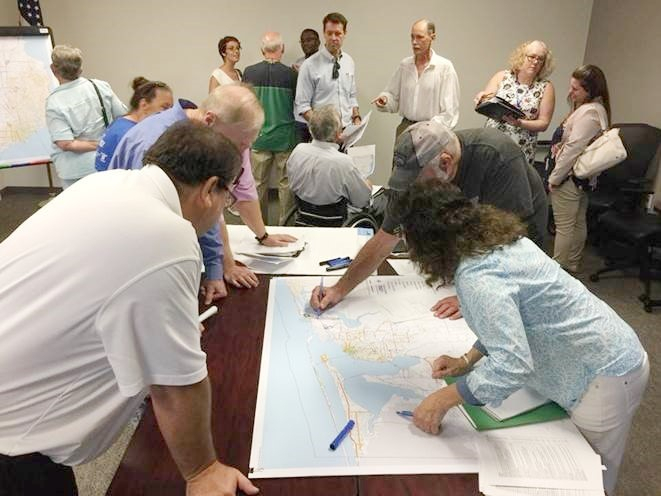 Attendees of the Project Priorities workshop interact with WFRPC Planner, Jill Lavender, as she presents at the Bay County Library in Panama City on July 30. 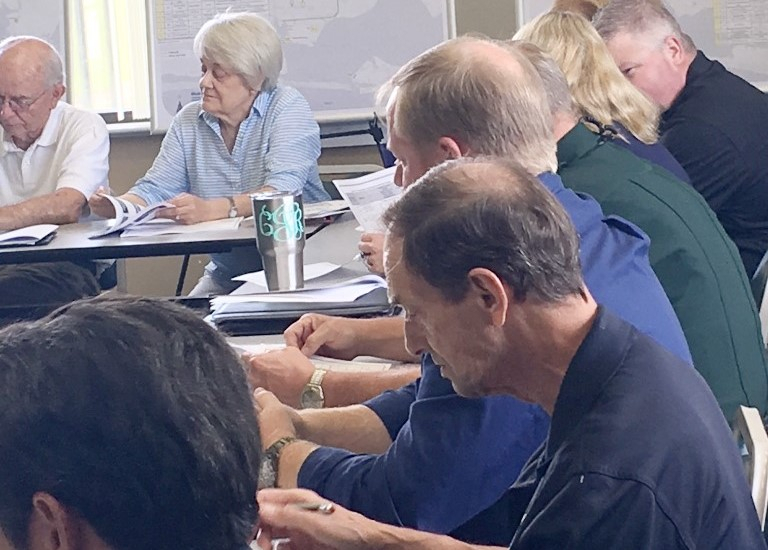 National Transit Institute held a two-day Transportation Planning training in Pensacola in July 2018. 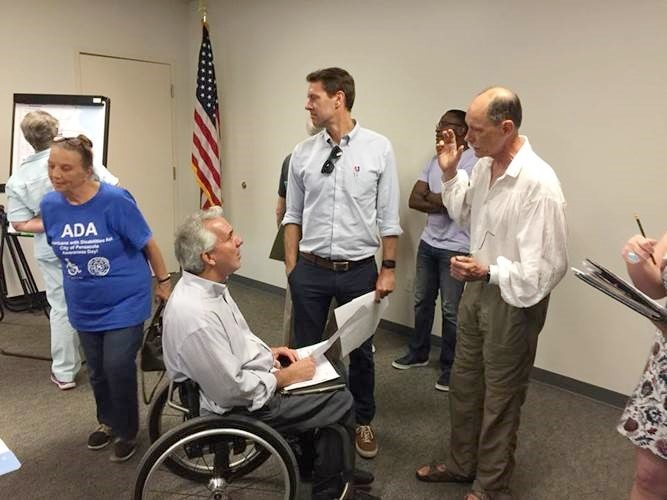 More than twenty attendees from across the nation, including California, Washington, D.C., North Carolina, New Jersey, Alabama, and Florida, gathered for this informative event. 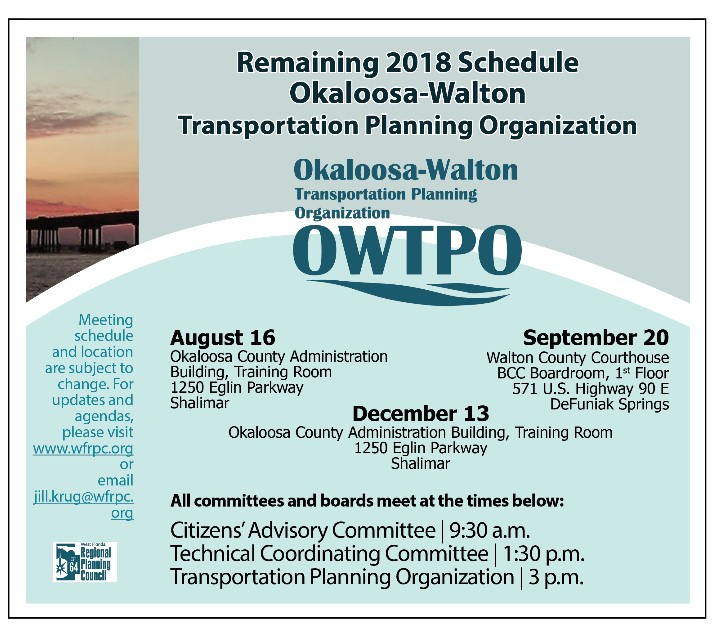 On Thursday, July 26, the West Florida Regional Planning Council hosted a public workshop to encourage citizens and municipalities to collaborate on project proposals for the 2018 Florida-Alabama TPO Pedestrian Bicycle Master Plan. 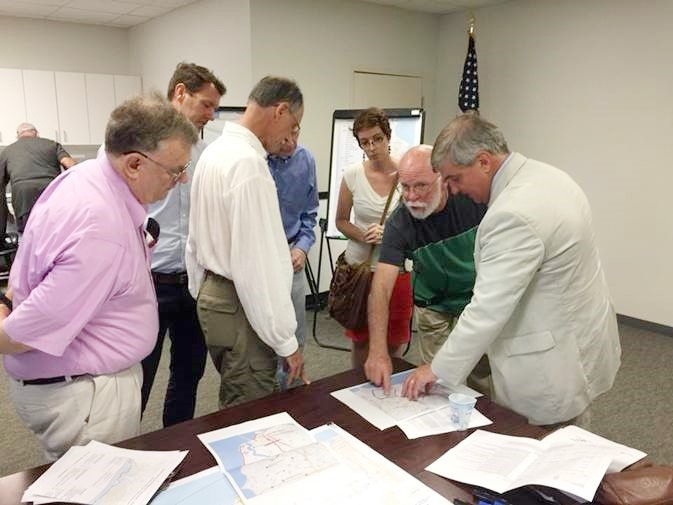 The meeting included a presentation describing the project prioritization process and the overall purpose of the plan. Following the presentation, attendees were invited to work in small groups to discuss and map project proposal ideas. 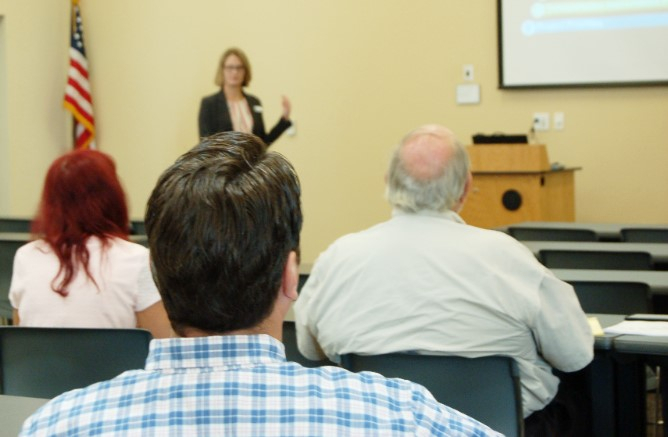 A Project Priorities public workshop was held at the Crestview Public Library, engaging citizens as well as committee and board members in the prioritization process. 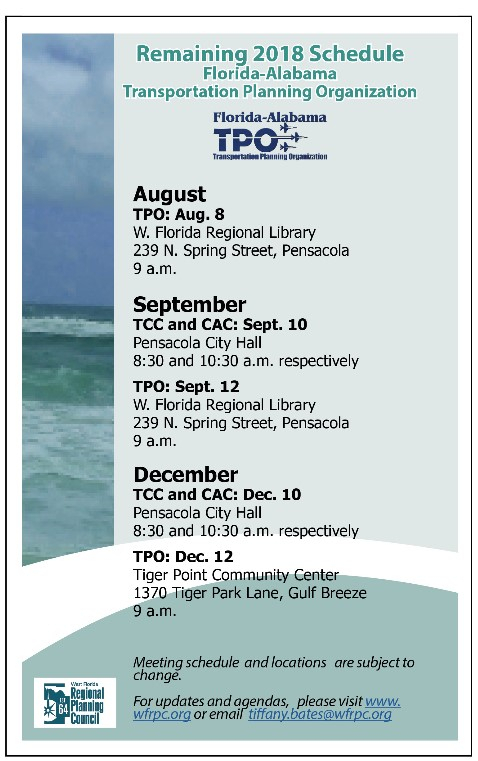 On July 19, WFRPC Chair, Kasey Cuchens, and WFRPC Executive Director, Austin Mount, presented a sub-grant to the City of Pensacola. 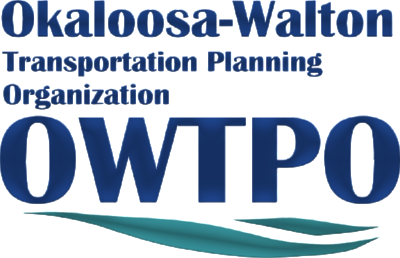 The award was given through the WFPRC's EPA Brownfields Revolving Loan Fund for the cleanup and removal of submerged Creosote pilings in the Maritime Park project. 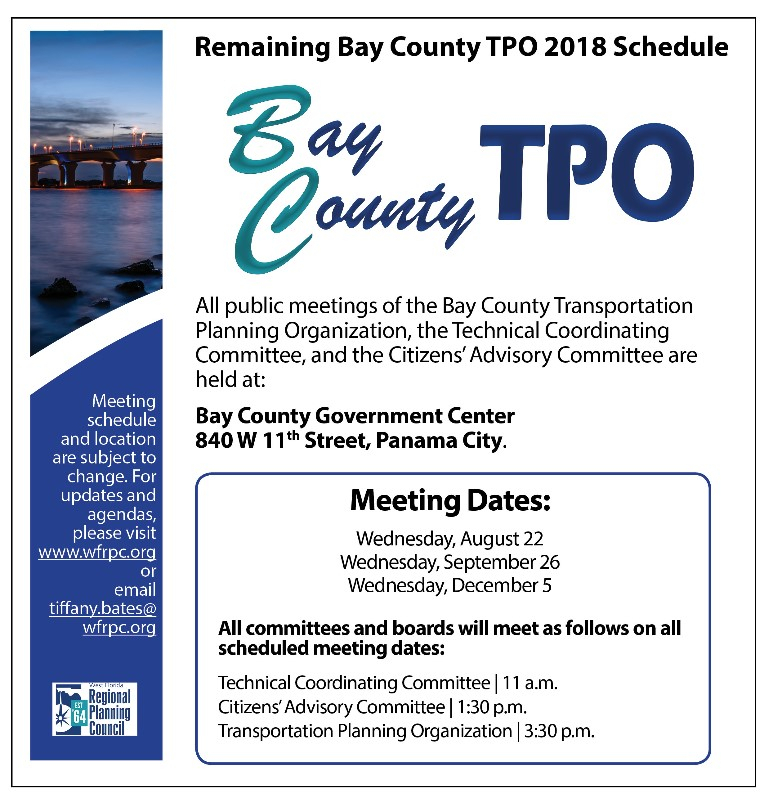 The cleanup is anticipated to be complete by the end of September 2018. 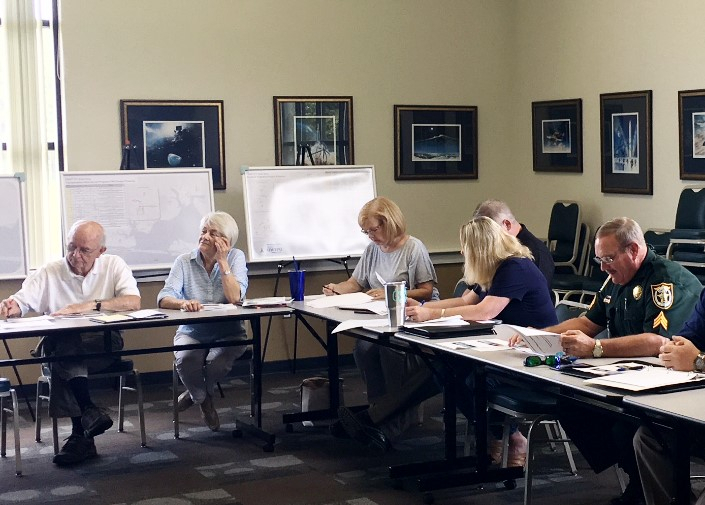 Safe Routes to School (SRTS) partnered with Escambia County Learn, Play, Grow Summer Camp the week of July 2 to teach bicycle and pedestrian safety lessons. Camp attendees learned rules of the road, how to navigate streets and intersections, and how to be safe while walking and biking. Through these lessons, youth become competent pedestrians and bicyclists, gaining lifelong safety skills they will use throughout their lives. 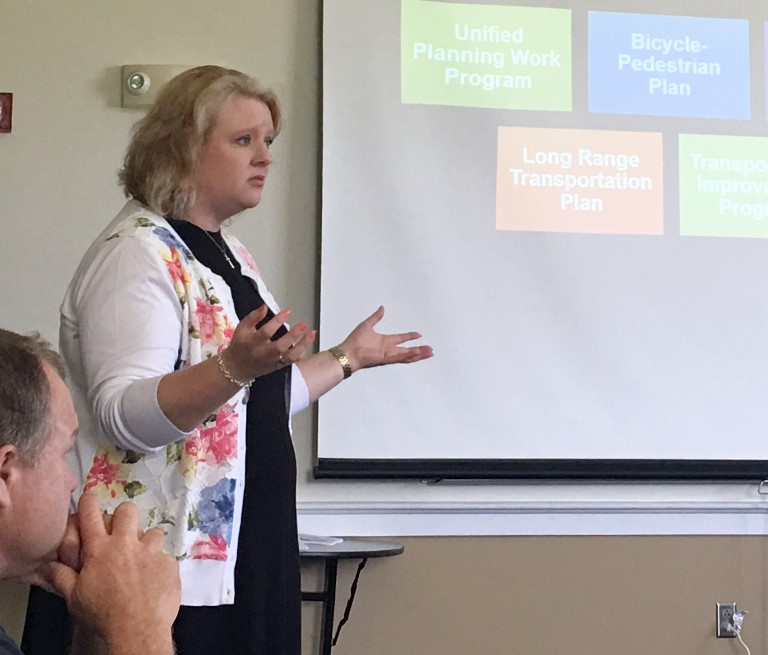 If you are associated with a school or youth organization and are interested in implementing bicycle/pedestrian lessons, please contact SRTS Outreach Coordinator, Caitlin Cerame or at 850-332-7976.